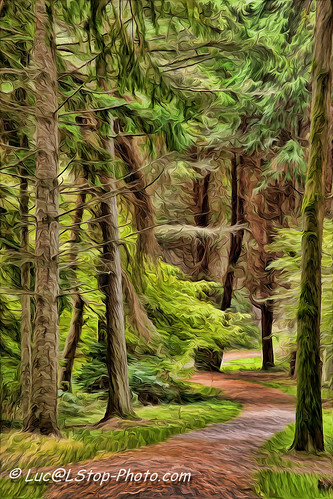 This photo was taken with a 5D Mark II and processed using Adobe Lab’s free Pixel Bender Plug-in for Photoshop for a fantastic oil painting look. The composition with the path is excellent and the lighting just draws you into this photo and makes you walk down this path. Excellent job Luc! I’m mesmerized by the colors and patterns as I could look at this photo for hours. I’m not a big fan of the watermark, so I’d suggest that Luc check out The Adobe Photoshop CS5 Book for Digital Photographers and learn how to do a overlay blend mode layer watermark. Beyond that it’s brilliant and I’d love to see it in a large print on a Epson 3880 (or the 4900 that is only a little more thanks to this rebate offer) using Epson’s Cold Press Natural paper. Nice, looks similar to an affect I get through Topaz. Looks really nice on these trees, nice shot! Mike - I assume you mean from Simplify right? What effect are you using?